First, I must thank Mr.Vijayakrishnan for informing me this. I could meet the organiser this evening, about an hour back. The event is being planned in Hyderabad on the coming 29th, Sunday evening, at Ravindra Bharati, a famous auditorium in the heart of the city. The organiser will be sending a soft copy of the invitation shortly, and then I will send it across. Our master is being honoured with this award. Alongside. Mrs.Vani Jairam is being honoured with PBS Puraskar 2013 award. There are many dignitaries gracing the occasion like Dr.D.Rama Naidu, and Drums Sivamani. Many (about 20) of the young singers of the current Telugu film industry would be performing (I am not familiar with the names). MM is expected to appear during the course of the function, and by about 8pm, the awards are bing planned. The Hindu might also cover the event. I hope and pray to be there. I will write other details after I get further information. thanks sai for your work . Also pls post yr report ,if you can attend the function . It was a memorable evening yesterday at Ravindra Bharathi . 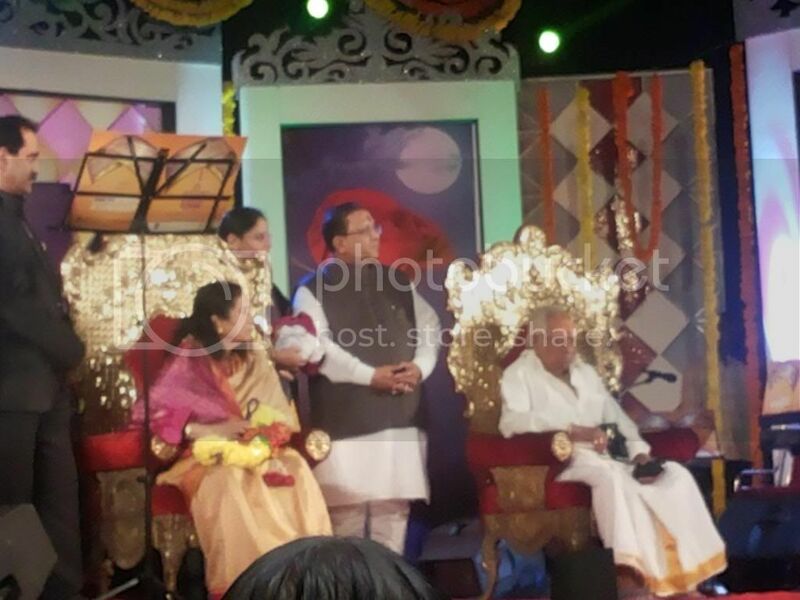 MSV and Vani Jayaram were treated with all respect and duly honoured by chanting vedic mantras . Fascinating aspect was that the entire crowd were cheering all along whenev er MSV's name came up . All the young singers as they took charge of the dias, immediately sung wholesome praise for MSV and started their singing. Sivamani also was honoured. His 2 sons also played the drums and Sivamani also joined them quickly and it was a wonderful exhibition of some scintillating drum work by the family ! Both VJ and Sivamani started their speech by saluting MSV and both acknowledged that they have reached this level today only due to their revered Guru MSV . Songs like Anbulla maan viziye, Pon enben, Nilavukku en mel were all sung in Telugu version the audience clapped loudly enjoying each moment. 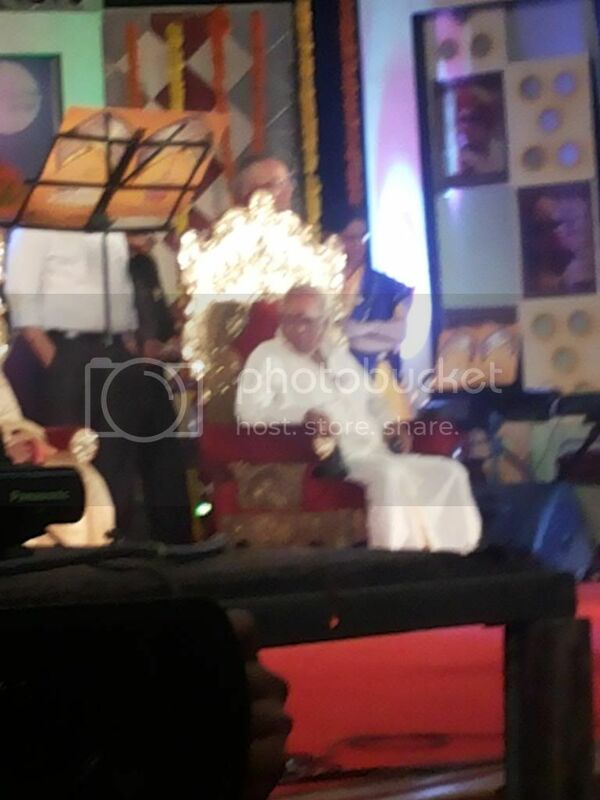 The programme commenced by around 6.45 went up to 10 pm and MSV was honoured at the end ( along with other 2 ). He appeared visibily tired and gave a brief thanks giving . 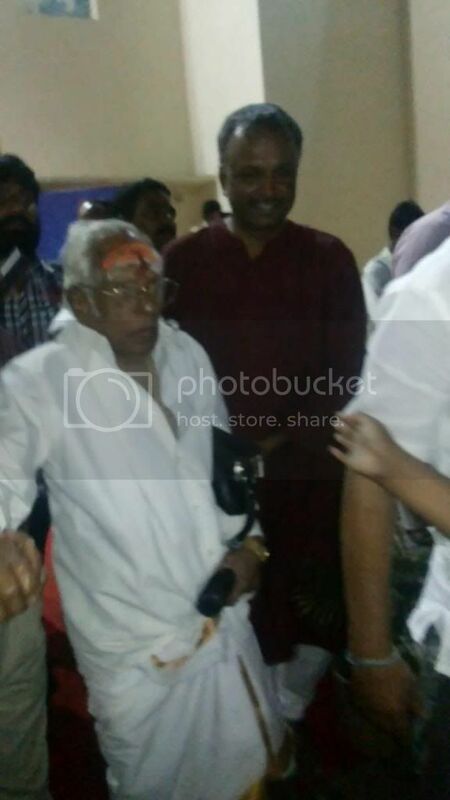 While leaving the auditorium, myself along with Mr.PBS Panindhar assisted MSV up to the Car. 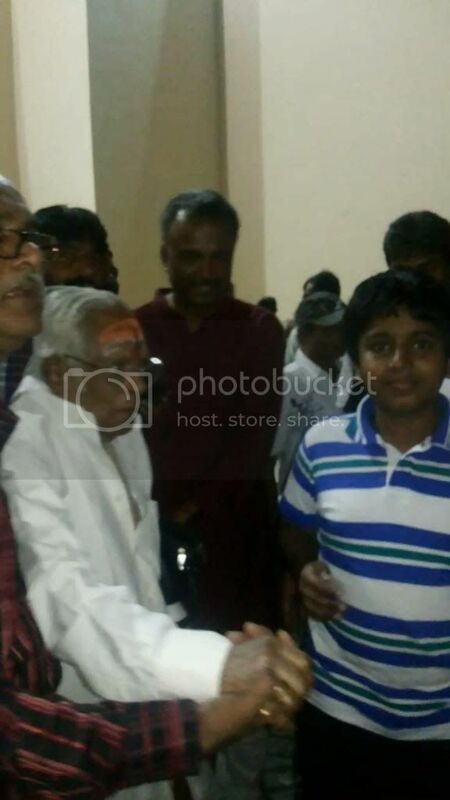 It was truly an unforgettable moment in my life holding the left hand of the one and only MSV ! We took some videos and photos. Here is a brief account of the PBS puraskar function, held on 29th September 2013 at Ravindra Bharati auditorium at Hyderabad, in continuation with our friend Mr.Balaji's report. The place is in the heart of the Hyderabad city. A simple arch at the auditorium entrance was decorated with a beautiful picture of PBS and pictures of Mellisai maamannar and Mrs. Vani Jayaram. The stage was elaborately decorated for the evening with the lighting, camera and sound support from ETV (probably). The function began slowly with the arrival of some dignitaries. The chief guest, Dr. D. Rama Naidu, the Dada Saheb Phalke awardee, could not be present owing to ill health, as was announced. The auditorium began to swell with an equal mix of youth and the elderly by 6.30pm. A small orchestra with key boards, tabla, dholak, pads, bongos, flute and other effects was brilliant. The rehearsals probably must have been on for a couple of days with many young and upcoming singers. As Mr. Balaji has mentioned, the songs of Sri PBS were chosen from a wide variety, though not composed by all music directors. But, many songs were those that were composed by MM, eventhough the anchor did not mention them everytime. The prominent ones belonged to the Telugu remakes of Policekaaran magal and Kaadalikka Neramillai, and many songs from these movies were sung. The beautiful ones were the telugu versions of �Pon enbaen�, �Anubhavam Pudhumai�, �Inda mandrathil odi varum�, and �Anbulla maan vizhiye�. Among the notable singers were the young Hemachandra (one of the earlier stars of Zee Saregama) and Sriramachandra (Indian Idol fame) who were excellent in their rendition. Mr. Balaram, a Tamil and Hindi singer from Mumbai, had flown in for this show and beautifully sang two songs. One of the lady singers who sang �Anubhavam �� duet mentioned that MM�s music was truly ahead of his time! Then, Mrs.VJ was on the stage. She sang a Kannada/Telugu duet, sung with PBS, tuned by Raajan-Naagendra, with a new generation singer, Saandip. (How lucky is he?) Then she chose a solo from the Telugu hit Maro Charithra, of course, composed by our MM! This was greatly welcomed by the crowd. She completed with the Shankarabharanam award winning �Maanasa sancharare�. When the anchor enquired her feelings after her Maro Charithra number, she remarked quickly that she still is afraid of singing before MM! The show, of course, became lively with Sivamani�s children playing on the drums. He too was requested to join, and he innovated, as his wont, on the tabla, on the drums, and even on someone�s suitcase!! The crowd was thrilled and enjoyed every bit of it. Then, our master was invited on the stage. Both the celebrities were made to sit on two throne-like seats. The organizers honoured them with the awards. The main sponsor/organizer, Dr. Nityagopal spoke about MM before honouring him. The event organizer Mr. Ramana spoke about PBS and the recent PBS show in Chennai, held just after his passing away. As usual, our MM spoke just a line, wishing and thanking all! Drummer Sivamani had spoken about his career under KVM. He also mentioned about his first movie, Ninaithaale Inikkum, under MM. What really satisfied us was the respect the crowd showed for MM when he was on stage and even when he was mentioned by the anchor a few times. Ms.Manju Bhaargavi, dancer and actress of Shankarabharanam too came on stage and showed her respects to both. She referred to both as �Gods�! Mr.S. 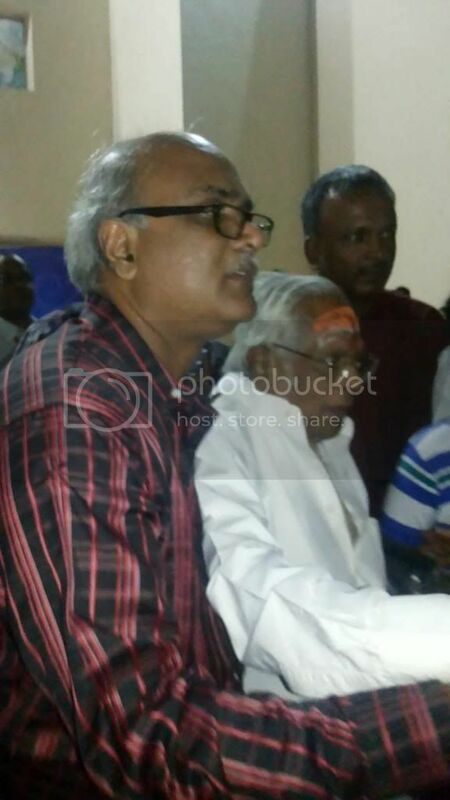 Gopalakrishnan, Vice Chairman of Bharatiya Vidya Bhavan, Hyderabad spoke on MM and VJ elaborately. He even mentioned about the innovations of MM and his efforts in introducing the world music to us. The highlight of the evening was the honouring of MM and VJ by pundits from the Thiruchaanur temple with garlands, abhishekam material, and prasadam from the temple, while chanting the Vedas! One should have seen our MM decked with garland and surrounded by such a devotional atmosphere!! A rare instance indeed! Then, considering the late hour of the evening and his age, MM took leave. I could only speak to Mr. Balaji by phone on Saturday, but could not recognize him during the show (I had not/have not yet seen him and did not have his mobile number till this afternoon). Probably, we were also alongside him as he was escorting our MM! We have to check the few photographs with us now to identify our new friend! At that time, we were walking along with MM�s daughter and were with them until the car left. With a big pranaam to our Mellisai Mamannar, I felt that I was blessed once again to be so near him and witness him receive an honour! So simple yet so sublime! The event then wound up with the mementos to all the participants and other. The memories still linger on and I still feel that I am in a lengthy dream! both of you are not only lucky but also have given good account of the programme . especially i am happy to hear vedic blessings was given TO MM . In the picture, we can see the three organisers to MM's left and immediate right. The person in the leftside of the picture is Ms. Manju Bhaargavi. Many thanks to Sai Saravanan for the extensive reporting and to Balaji for the photos and videos. While appreciating the efforts of MSV in scoring some exceptional items for Telugu screen and Andhra's recognition there of, Shri. S R S has lamented that MSV's native state has done precious little to honour the legend. But, MSV being so much polite has in itself done enough damage to his prospects, while only his admirers recall his admirable qualities as a composer and as a person. Look what the very industry that made big fortunes out of his benevolent attitude has been doing to him other than lip sympathy at all opportune moments. For Tamil politicians MSV is a Malayalee and for the Kerala politicians he is from Tamil nadu. Without batting an eye lid, they [both groups] would muster his prowess when the occasion demands. Whether we like it or not, Divine controls on mind are very different. A person who is absolutely articulate of his job, never trumpets his personal glory even if closely interrogated for various niceties displayed only by him. I am not drawing this inference from a review of MSV himself. I have observed intimately the same kind of supreme talent and tight-lipped silence [at times mistaken for arrogance -though uncharitably so] in many Professors, Eminent Scientists and Judges of impeccable honesty. God seems to have instilled these two qualities of Efficiency and modesty if efficiency is of the highest order. Unfortunately, when efficiency is not at its best, the candidate resorts to calculated gimmick and invariably succeeds taking advantage of the social glamour bestowed on him or her. I have witnessed the same trend in persons who have had no God fathers , but have given their very best to the system they have served all life and ended up un-recognized. If we get into their suffering, it will be a sad story that such honest persons have been humiliated in addition to being ill recognized. I am not defending the kind of impropriety witnessed around. But, I am trying to identify the the mental make-up of true stalwarts who care a hoot whether or not recognition comes forth. The suggestion is only to improve the elegance in writing and nothing more. It is never my intention to cite mistakes and tender correctives. With your dedication to substance above that of style, there is no room for anything else. So, if I had made a suggestion, please dismiss it as an intrusion of a sinister mind. My reference to 'etc' was not for you alone; to me it has been somewhat of a lessor option. Necessarily, on matters of expression no one can interfere when the intent is clear. By bringing forth references to Thesaurus, you have given some clarity. With no intention to hurt anyone, I have no hesitation to tender an apology to you for my misplaced enthusiasm for certain styles of writing. Thank you for providing an opportunity for me to grasp some idea. 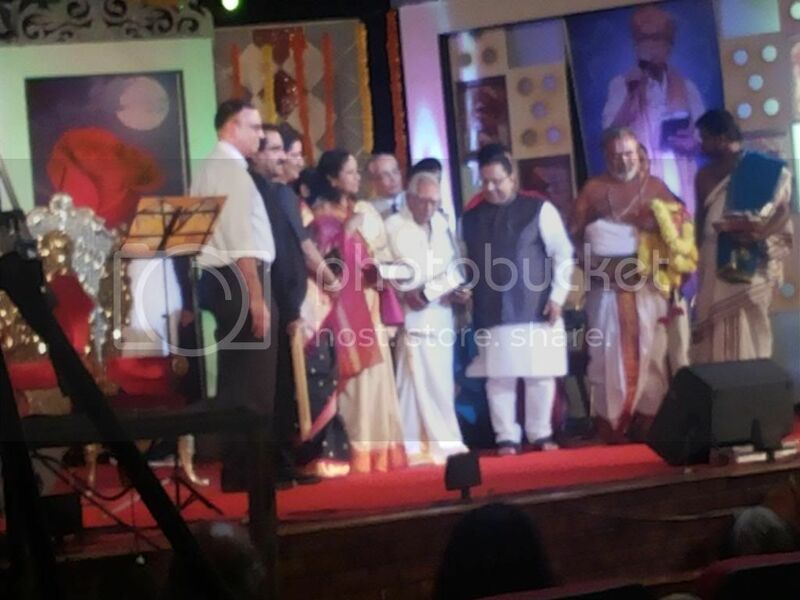 PBS Purskar 2013 Awards giving function was held in Ravindra Bharathi, Hyderabad on Sunday by Arun-Nitya Gopal Foundation in memory of Singer P.B.Srinivas. 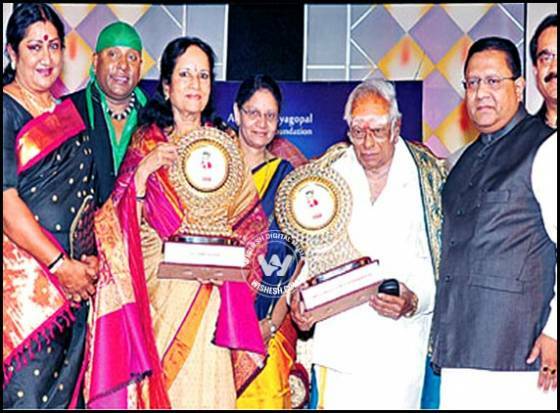 Music Director MS Viswanathan was honored with the Life Time Achievement Award in the program. 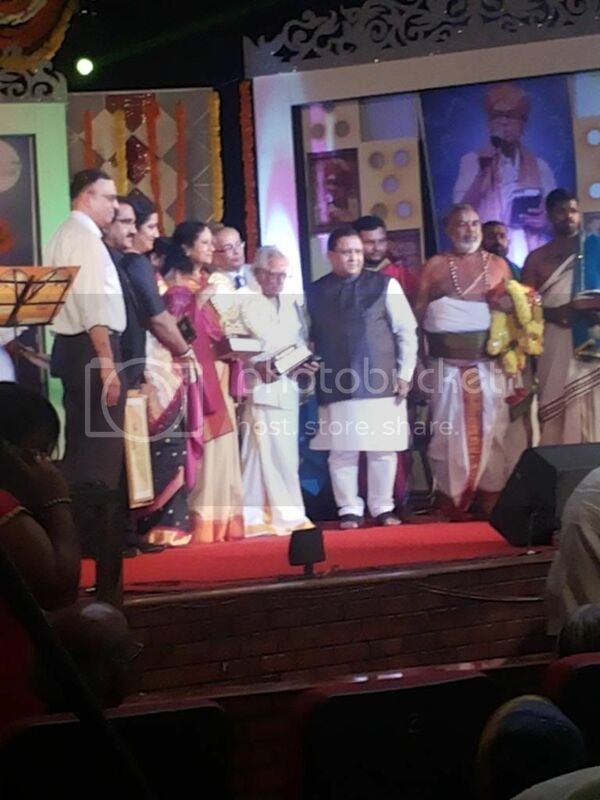 Famous singer Vani Jayaram received PBS Annual award for 2013.